without becoming bored. Since the 1927 film Metropolis, robots have lent a helping hand to humans in many science fiction movies, such as Star Wars, Wall-E and Elysium. The television cartoon series The Jetsons featured Rosie the robot maid. 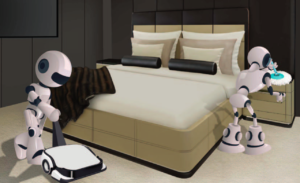 Could robots soon take over the cleaning? Or, will they take over the world? Metal humans have featured in stories as old as Greek mythology. In 1818, Mary Shelley published her story of Frankenstein, the scientist who created an artificial human. A couple of years later, a science fiction play by Karel Capek called R.U.R. (Rossum’s Universal Robots) first used the word ‘robot’. The term was based on the Czech word ‘robota’, which means forced labour – so developing them in the real world as servants seems appropriate. car factory today uses hundreds of robots. The military has used robots that can independently fly, refuel and select targets to attack. Honda’s ASIMO (Advanced Step in Innovative MObility) robot, first unveiled in the year 2000, looks like a short astronaut. It can climb stairs, run, kick a soccer ball, dance, carry a tray of food, and knows to return to a power point if its batteries are running low. However, the robots found in the home today are only vacuum cleaners or toys. A robot vacuum cleaner shaped like a large discus became available in the 2000s, and more than 10 million have been sold. If robots can communicate with each other, teach themselves new things and learn without human help, could they team up and harm the human race? Not according to the famous science fiction writer Isaac Asimov, who came up with the three laws of robotics. These are: (1) a robot may not injure a human being or, through inaction, allow a human being to come to harm; (2) a robot must obey the orders given to it by human beings, except where such orders would conflict with the first law; and (3) a robot must protect its own existence as long as such protection does not conflict with the first or second law. A scary idea is the possibility of computers with artificial intelligence becoming smarter than humans. This point in the future is called the ‘singularity’. After this point, it is impossible to predict or understand what such ‘intelligent’ beings would do. Perhaps they would compete with us for resources, or decide we were too harmful for the environment and exterminate us. But in the meantime, those robotic vacuum cleaners don’t look too dangerous. For more on trusting a robot to clean your room, and 41 other inventions of the future, check out our book, Imagining the Future: Invisibility, Immortality and 40 Other Incredible Ideas, by Simon Torok and Paul Holper (CSIRO Publishing), http://www.publish.csiro.au/pid/7344.htm.